Satvik Pochiraju shows off his medal and the National Geographic Almanac he won at the National Geographic GeoBee Ohio State Competition in March. Pochiraju will head to Washington, D.C. next month to compete in the national championship. Satvik Pochiraju estimates he spends three hours per day studying geography throughout the weekdays. On weekends, he said, he typically puts in an additional six hours of study. That level of dedication to an academic study might not be typical of a fifth-grader, but Pochiraju is far from an average elementary student. Beginning on May 19, the Olentangy Meadows Elementary student will compete against thousands of the country’s smartest young geography enthusiasts, grades 4-8, in the National Geographic GeoBee, held annually in Washington, D.C. Pochiraju earned the honor after taking home the title at the Ohio State GeoBee Competition in Canal Winchester on March 29. Pochiraju won the school championship a year ago, his first year competing in the National Geographic competition, but fell short of winning the state title after being eliminated during the preliminary stage. Back for his second attempt at qualifying for the national competition, Pochiraju said he wasn’t nervous heading into the 2019 state competition. Asked what was going through his mind when he won the state championship, Pochiraju expressed relief but also validation of the work he’d put in to reach that level. “You’ve studied well, so keep studying well and win everything,” he said of his message to himself following the win. Competing on big stages is nothing new for Pochiraju; he won the national championship in the elementary division at the 2017 International Geography Bee. That win earned him a trip to Berlin, German, where he competed for the world championship last summer. In addition to his own experiences, he has an invaluable resource at his side in his older brother, Saket, who is a decorated Geography Bee competitor in his own right. Saket, now a student at Olentangy Orange High School, won the 2018 middle school world championship at the same world championship his younger brother competed in. Satvik said he has been watching his brother compete in competitions since he was 4 years old. In helping his brother study for events, he said his own interest was peaked, setting him off to follow in his big brother’s footsteps. He added his brother’s teaching methods can be “rough,” because, after all, he is a big brother. “He doesn’t give advice nicely, but he does give good advice,” Satvik laughed. Along with his brother, Satvik is also grateful for his parents, Sudhakar and Umasalini, who he said always find the time to quiz him throughout the week after long days at work. And, of course, they also have given him great advice, in a much nicer fashion as well, Satvik said. Geography is undoubtedly Satvik’s forte. He said his favorite country to study has been Switzerland, in part because he was able to visit when in Germany for the world championship. But he added he also enjoys the country because of its political neutrality through the years, pointing out Switzerland didn’t join the United Nations until 2002 and is not a member of the European Union, as if both facts were common knowledge. However, Satvik’s academic talents aren’t limited to any specific discipline. He said he has started competing in essay writing competitions this year, recently finishing second in an event. He submitted three pieces for the Inklings Writing Competition, one in each of three categories: fictional narrative, non-fiction narrative and poetry. Math and history are also subjects he enjoys. In his spare time — what’s left after studying — he enjoys Carnatic music, which is a style of South Indian classical music, as well as soccer, badminton and cricket. He plans to play tennis in middle and high school, just as his brother does now. As for the remainder of his Geography Bee career, in which he still has three years left to compete, Satvik said he is simply hoping to accumulate as many high ranks as possible in competitions. He is also looking forward to meeting up with friends he has made from past trips and competitions, anticipating the trip to Washington, D.C. will be a lot of fun. However, he said he is going to nationals with the single goal of winning the competition. Asked if a career in geography is something he’s already set his sites on, the well-spoken and extremely driven fifth-grader speculated as if he’d already given the thought plenty of attention. He finished by saying he wants to be an architect or CEO of a company someday. 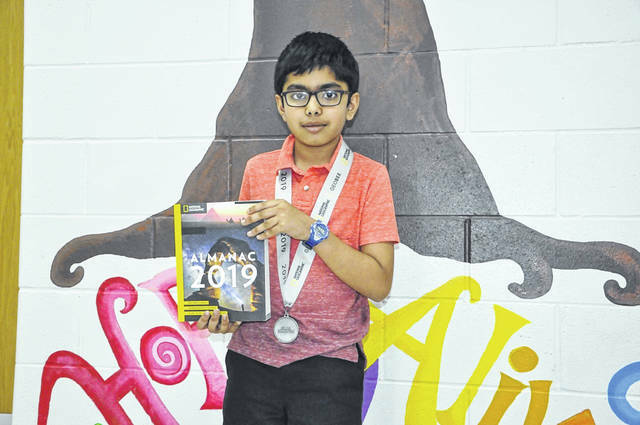 https://www.delgazette.com/wp-content/uploads/sites/40/2019/04/web1_satvik.jpgSatvik Pochiraju shows off his medal and the National Geographic Almanac he won at the National Geographic GeoBee Ohio State Competition in March. Pochiraju will head to Washington, D.C. next month to compete in the national championship.